Start of Homestead Trail from helipad area before the bridge at Smith Rock State Park. 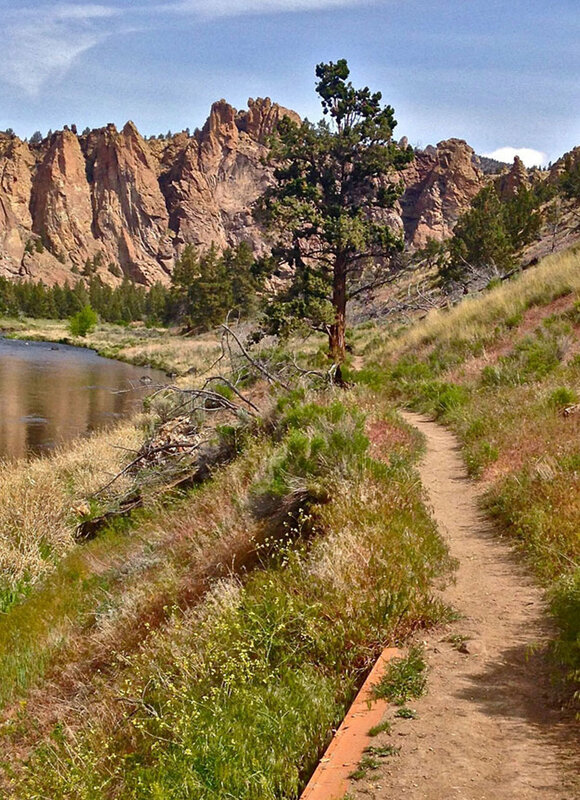 Homestead Trail along the Crooked River towards the Monument area at Smith Rock State Park. Homestead Trail signage to ascend out of the canyon to the Northern Point at Smith Rock State Park. The horse ford area along the Homestead Trail across the Crooked River at Smith Rock State Park. The Monument is the large pinnacle of the group in this area on the Homestead Trail past the horse ford at Smith Rock State Park. Alternate way up and out of Smith Rock State Park on the Homestead Trail. Homestead Trail standard route up out of the park canyon before the horse ford at Smith Rock State Park. 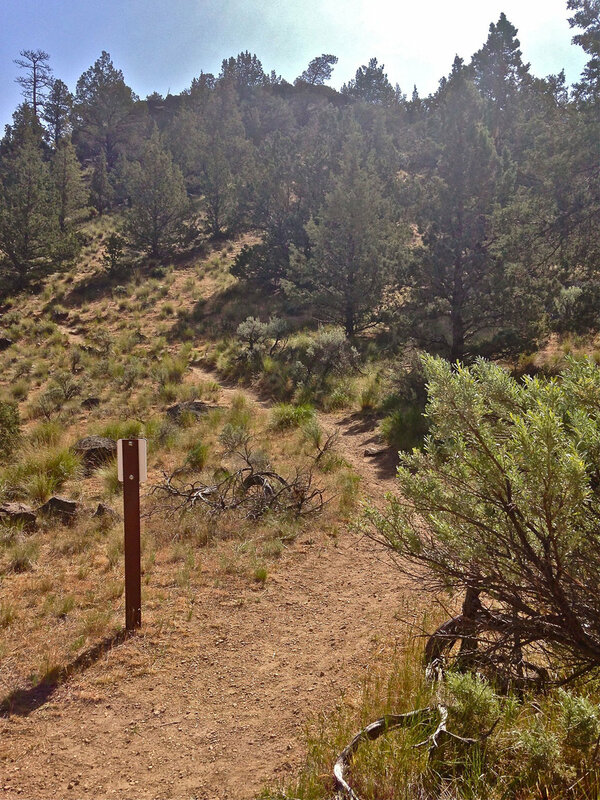 Start of steep section of Homestead Trail on standard route with Monument area in the backround at Smith Rock State Park. 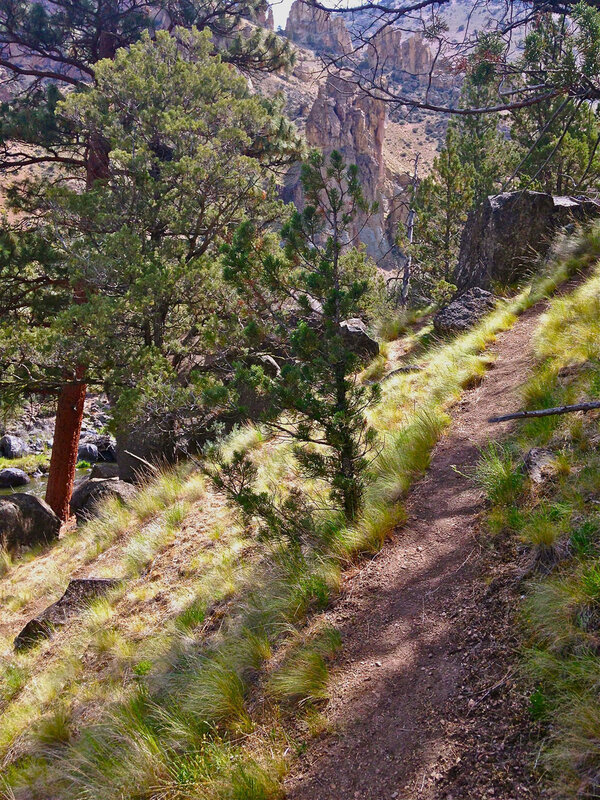 Rocky section of steep uphill of standard route up out of the canyon on Homestead Trail at Smith Rock State Park. Final gravel path at the end of the Homestead Trail coming out of the park canyon onto the Northern Point of Smith Rock State Park. NOTE: Horseback riding and mountain biking restricted on the uphill/downhill portion of the Homestead Trail. You get there by either the Canyon Trail or the Chute Trail from the Overlook just past the Welcome Center. Continue through the helipad area, going through the marked trail opening in the fence to follow the path by the river. It starts out flat and easy for the first .5 miles. Along the way you’ll have views across the river of the climbers on the Red Wall. Opportunities abound to spot wildlife, both in the water, and flying overhead. As well as the occasional marmot, rabbit or snake. As you approach the bend of the horse ford, you can make a sharp right to start your ascent up and out of the park. We encourage you to continue on past it though. You can explore unidentified trails for a nice picnic among the boulders by the rushing waters of the river gorge. Completing the loop of the unidentified trail puts you back on the main Homestead Trail. It begins its steep climb for .24 miles along switchbacks that provide great views of the Monument area and the river below. Once you reach the parking level, you can continue straight down the gravel path. Go past the amphitheater viewpoint and exit into the Turnaround Parking area. From there it’s a 10-minute walk back to the Welcome Center. See TIP below to check out the North Point Trail while you're there. We recommend you hang a left at the junction when you reach the parking level, to join up with the flat, .33 mile North Point Trail loop. Spectacular views are plentiful when you are on top of the Northern Point, another popular climbing area. During nesting season have binoculars to spot the eagles on the Monument walls. Just be careful to keep children and pets close when you get to the unconnected rock columns along the ridge.